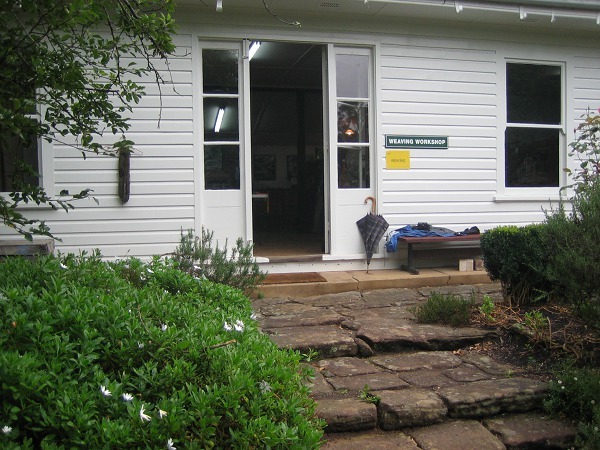 Some images from last week’s class with Liz Williamson, in Mittagong at Sturt Summer School, starting at the end with our final day exhibition. My 4 Trail Markers on the left. Des's work in black on the right. Natural dyeing, and tube in fishing line by Des - a brand new weaver. More dyeing and weave from Chris. She picked up the pine needles on a class shopping excursion. ... developing extensive work done previously. Unfortunately I didn’t get decent photos of the other class members’ work. There were nine of us in the class with Liz, a particularly pleasant and companionable group. Liz provided a really rich and varied learning experience. 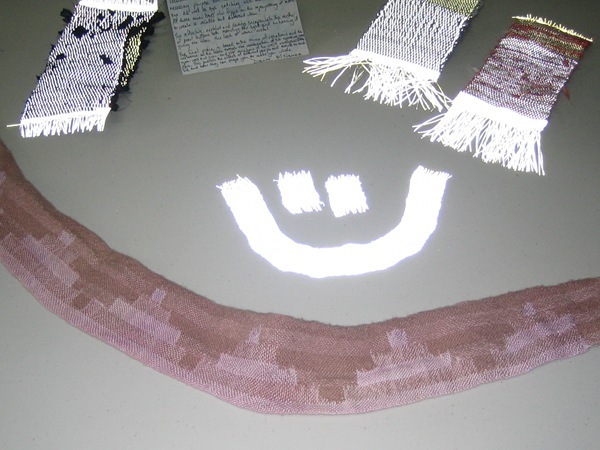 We examined examples of cloth that interested us – everyone brought some, including heaps from Liz, and talked about how they could be explored or reinterpreted for contemporary designs. 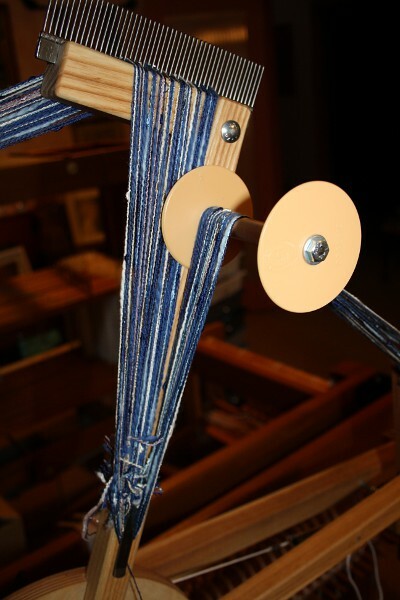 Liz had a fast way of getting a sampling warp onto the loom, demonstrated various options for warping, gave us extensive notes… but most impressively was able to help two brand new weavers do some really interesting work. Liz gave them just enough theory at each stage for what they were doing, to avoid problems and produce a viable structure while exploring and expressing themselves. 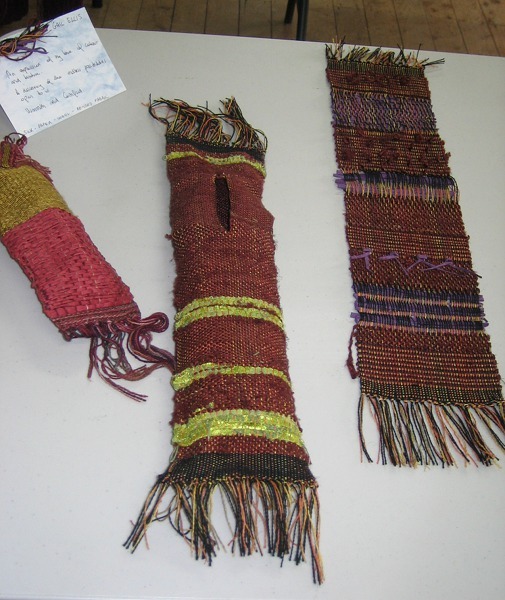 Both Des and Chris brought lots of experience in other areas of textiles and creative work, and I think both are now enthusiastic about learning more and incorporating weave into their repertoire. 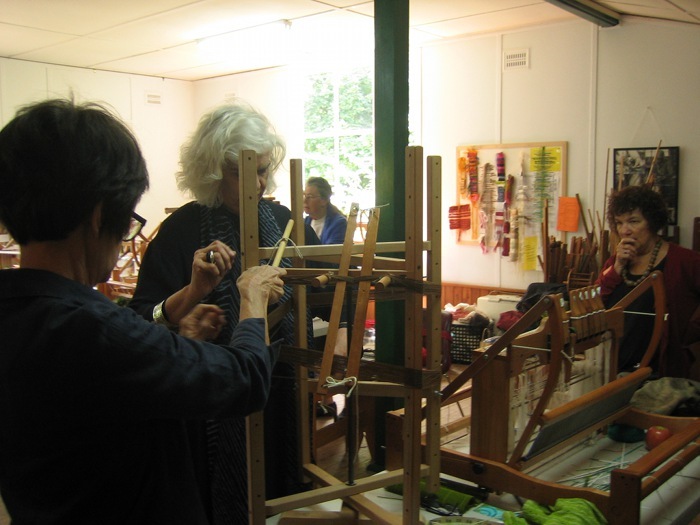 Liz also organised visits to the weave room by Elisabeth Nagle, a master weaver from Europe who ran the Sturt weave studio for around 50 years, and Melanie Olde who currently teaches there. Plus a number of us sat at dinner with weaver Sally Blake and her fellow exhibitor Vedanta Nicholson following their floor talk at the Rain Gauge exhibition in the Sturt Gallery. 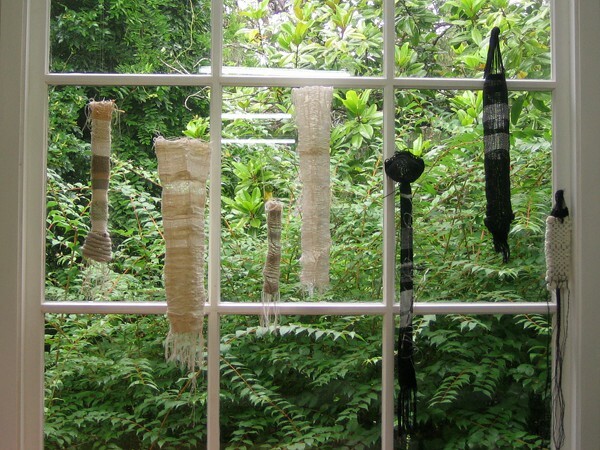 With all that inspiration available, Liz guided each weaver in their own chosen exploration. 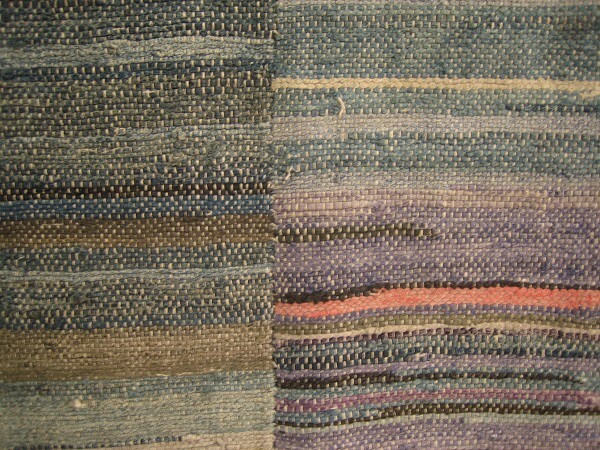 Many of us used double weave as a structure, but with widely different materials as weft. I decided to challenge myself by avoiding strong colour, instead focusing on texture, light, and shadow. 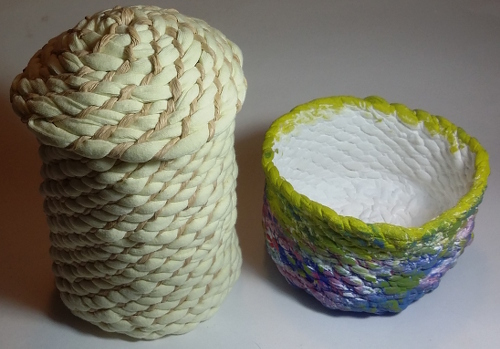 I tried to be really free and spontaneous, exploring the properties of some new-to-me materials – a couple of different paper yarns, cut strips of hessian, garden jute twine, paper rope… I struggled for much of the time, but was very happy and excited by the results. 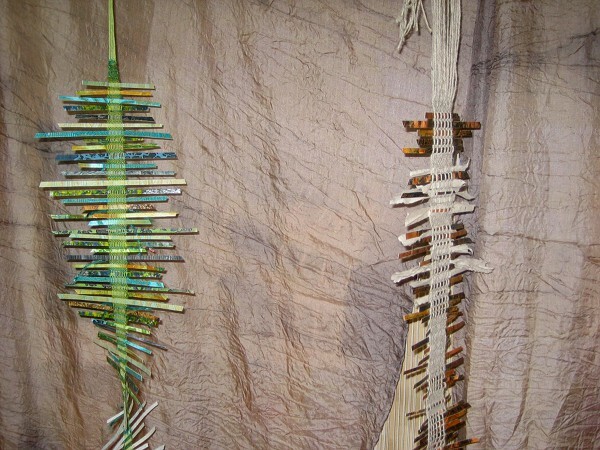 I like the things in themselves, but also that as weaving progressed I continued to learn, to experiment, to examine what happened in one piece and build on it in the next. In the end (!) it was a very satisfying process that I want to continue in my OCA work. There was one part of the class I didn’t participate in, and I want to write about it here not to get into any big discussion but because in the past I’ve had definite opinions which I’ve later reversed and I’m wondering if this will be another. So to my future self, wondering if one day I won’t believe I thought this… I don’t get natural dyeing and its current huge popularity. 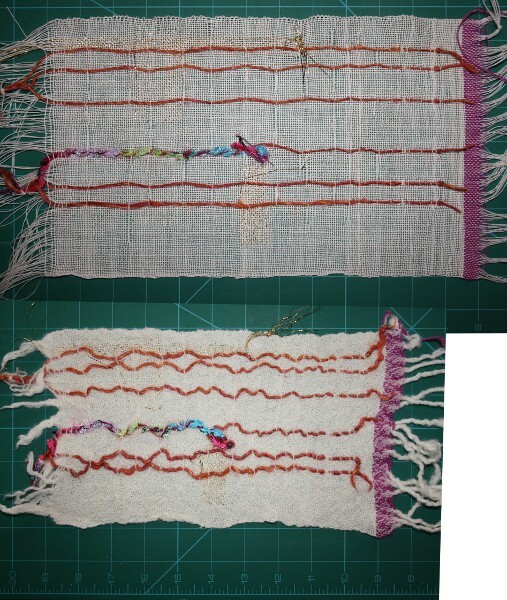 Yes, there can be some incredibly beautiful results, but use of synthetic dyes can also give really stunning results – and both can produce blah. 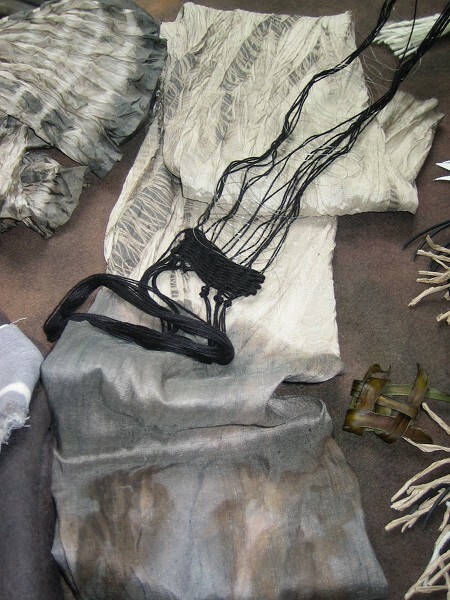 It’s the assumption that “natural” dyes are somehow intrinsically gentler on the environment, safer for the user, and generally “better” that bothers me. There may be studies out there which looking at the whole chain of production and use (mordants?, commercial cultivation/production of madder/cochineal/…?, packaging and transport?, …). I don’t know, and in any case as a hobby dyer I suspect the difference would be negligible in comparison to my impact on the environment as an urban dweller who is happy to drive my car around the state going to weaving classes. Rant over. This was a great week, I really hope to keep in touch with the others in the class because they were an amazing group, and I’m looking forward to seeing influences from the class in my future work. With seven wefts tried on my leno sample there was a clear and totally unexpected winner. Which will remain unseen until the Big P2P2 Reveal. In the meantime I have a few detail shots of the bead leno setup. In leno warp threads swap positions instead of running along neatly beside each other. Check my photo in this post from February to see a diagram. Back then I used “doups” to get the swapping. 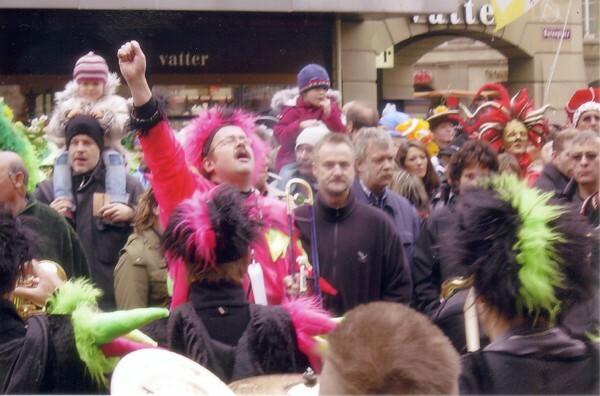 This time it’s “beads” – or pieces of a drinking straw in this instance. The first photo shows the setup between the heddles (at the top) and the reed. 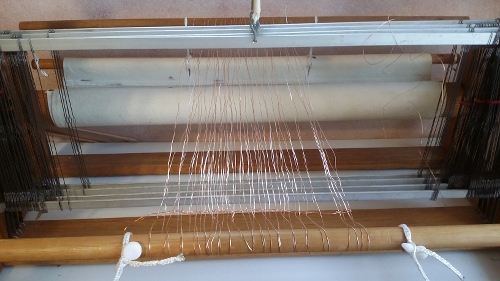 I used a straight threading for the warp – that is, starting from the right, a thread on shaft 1, the next on shaft 2, then shaft 3, then shaft 4, and repeat in sets of 4 threads, so looking at the loom from the front you have 4-3-2-1 – 4-3-2-1 – 4-3-2-1… Note that each set of 4 go together through a single dent of the reed – very important because otherwise the swapping wouldn’t work. 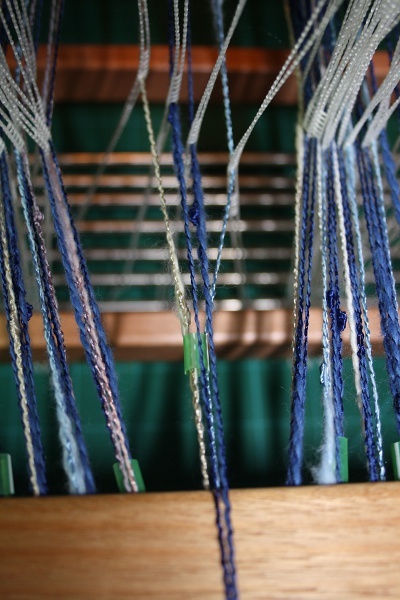 While weaving leno the threads on shafts 2 and 3 just sit there – the world revolves around them. 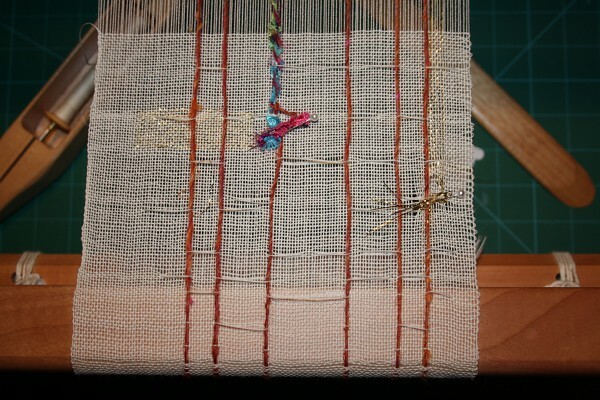 I put through the weft in front of the reed and that order is captured. Thread 4 has swapped position. 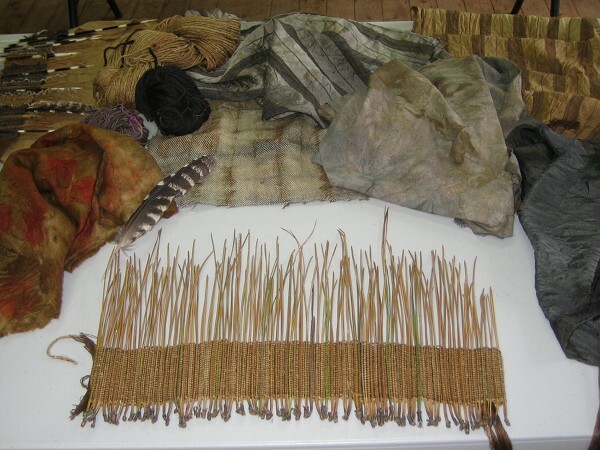 A pick of weft captures that swap. Repeat those two picks. 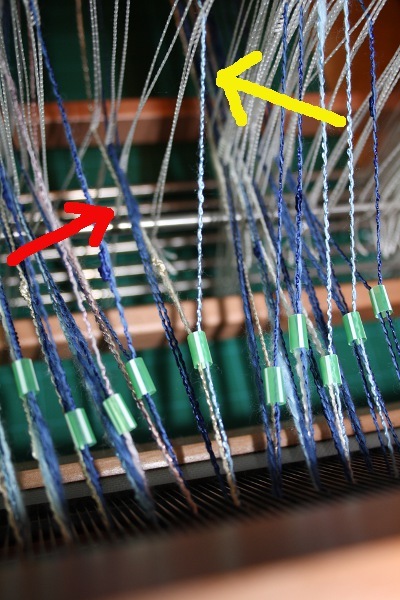 The warp threads on shafts 1 and 4 appear first on the right of the group, then on the left, then the right, wobbling their way down the length of the cloth. You can see it a bit on the loom in the last post, but you don’t get the full wobbly goodness until off the loom and wet finished. I think it’s amazing – magic! Easy to set up, not too tricky to weave. 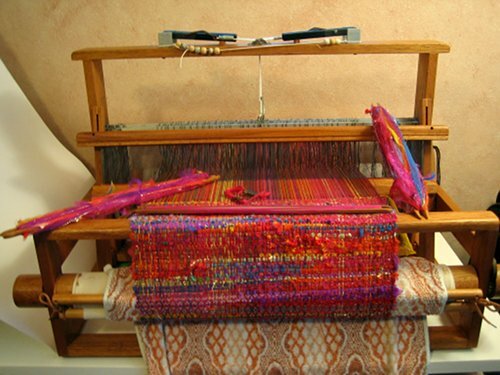 The shed is not as good as standard weaving – after all the warp being pulled across is pulling down on the straw, and also pulling up on the stationary threads as it goes underneath them. Plus in this particular example I am using textured yarn with blobs of cotton and I have to be gentle given the abrasion of all the warps rubbing as they are pulled around. So I am gently separating and spreading the shed with my pickup stick every single pick. This sounds slow, but the main work has already been done automatically by the bead setup and there are so few picks per inch that it’s wizzing along very happily. 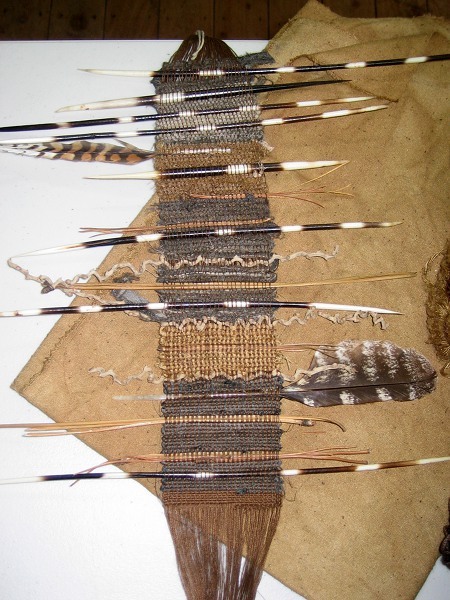 notes from my weaving teacher, Liz Calnan. “A new twist on Bead Leno” by Kathryn Wertenberger. 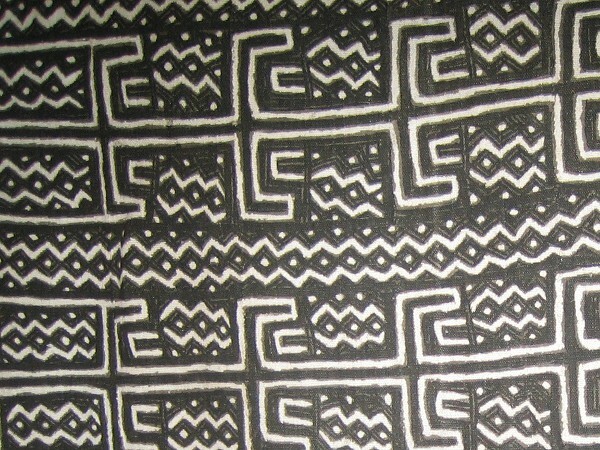 Handwoven November/December 1989. 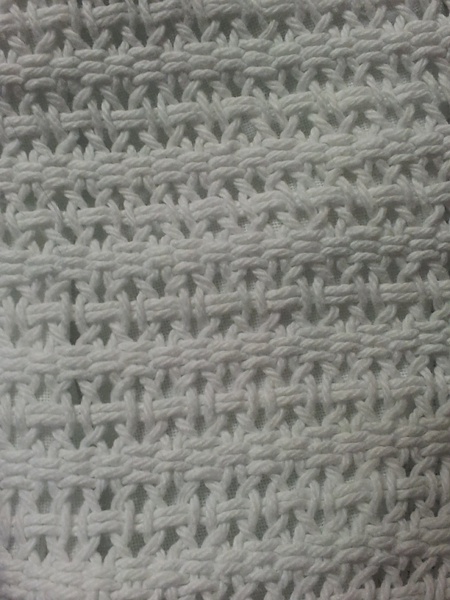 Last week I had a sample based on one of Cally’s photos and was making plans for a scarf. But I’ve allowed myself to be distracted. 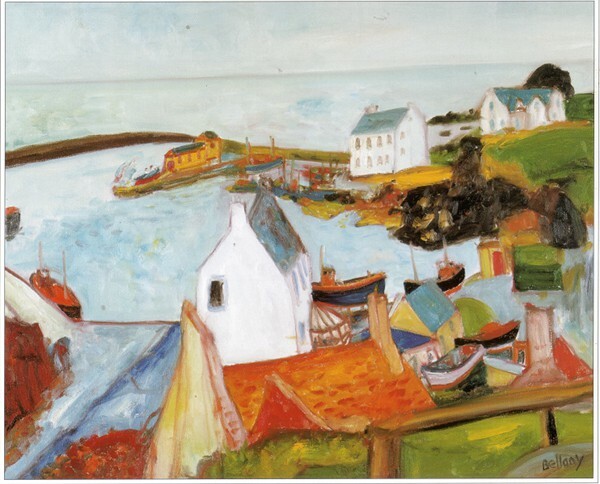 East Neuk by John Bellany. This image was one that really attracted me from the beginning. I could imagine standing looking down at such a harbour, cheeks glowing from the walk up the hill, hair a bit sticky from salt spray, a slightly chilly breeze buffeting me. I’d play with the image in my mind at odd moments, trying to figure a weaverly response. Perhaps a scarf to wear against that chill, not too heavy, blending into the sea colours. 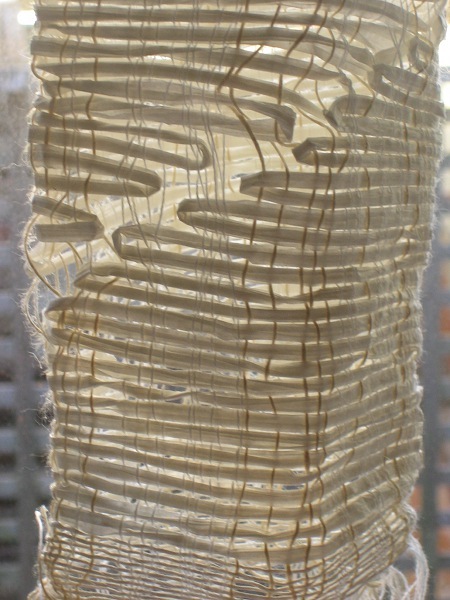 Leno could be a good structure – the twisting of the warp ends (threads) provides stability and allows lighter, more open weaving. 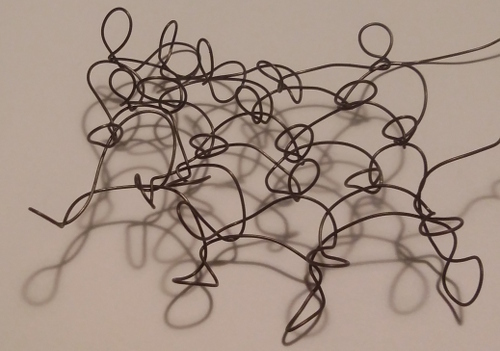 The threads move back and forward, possibly reminiscent of waves. The image from a post in February gives an idea of the effect – although then I used wool and mohair, too fluffy and warm for the current idea. It took a while to find a yarn that I thought might work, but I had a big surprise when I got home and compared my colours with the picture – nothing like!! It’s not just a matter of colours not matching in different lights. More that there simply is no dark blue in the image, just for starters. I’ve been remembering times I’ve stood on hills, looking at harbours and sea, and my memories definitely tinted my purchasing! At this point I’ve decided that the idea is to use the image as a starting point for a design, and if I’ve continued on to somewhere a bit different then that’s fine. 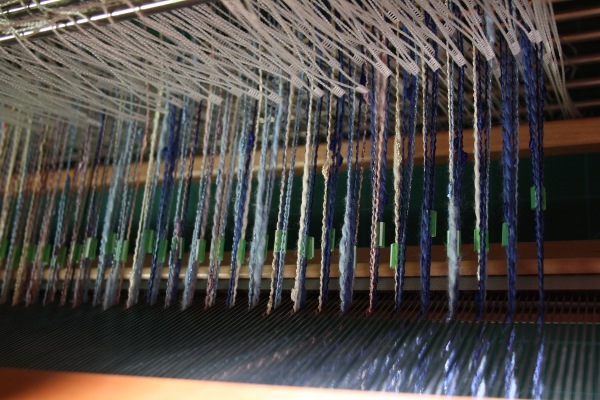 Yesterday I wound a warp with lots of room for both sample and a finished scarf. 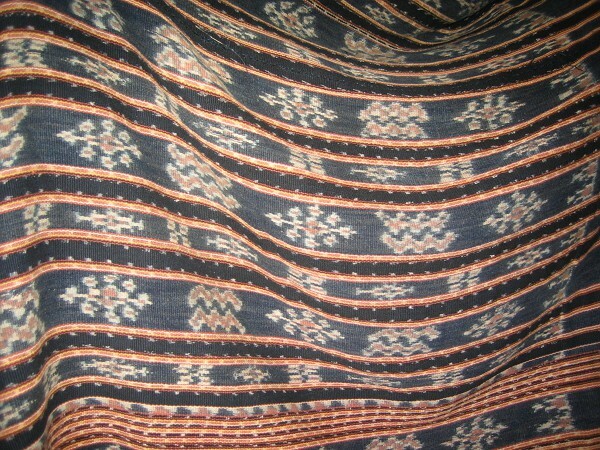 The photo shows a section that was a third of the width on the loom – 4 inches. 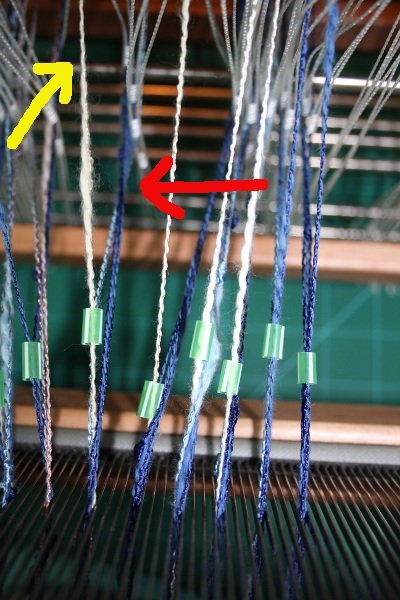 I really enjoy using the warping wheel to mix colours in the warp (and be nice to my back), however I really need to improve my methods of getting such warps onto my table loom (which I often prefer for samples and experiments). It didn’t get nasty or tangled, just very slow, painstaking and inefficient. Today I finished dressing the loom and have started sampling. The warp is Patons’ Sorrento – 62% viscose, 28% cotton, current sampling at 10 ends per inch average, although obviously not evenly spread. I really wanted a yarn with some shine and some slubs (ruffled waters). This might be a bit tender and catchy for weaving leno, but seems to be standing up OK at the moment. I’m trying out bead leno and gently easing the shed with a pickup stick every pick. Fiddley but rather pleasantly absorbing. 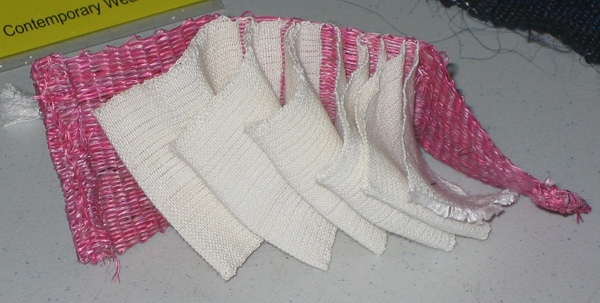 I’ve tried a few wefts so far – cottolin, Xie bamboo and 20/2 silk. I need to do a bit more then will see how it behaves off the loom and in the finishing. The sample on the loom here is now cut off and finished (vigourous handwashing using olive oil soap and very hot then very cold water to promote fulling/felting/shrinkage). The photo shows before and after finishing. The resulting fabric is quite soft, reasonable drape, and would be fine as a scarf. Both the novelty supplementary warps are reasonably attached to the base cloth – not enough for hard wear, but shouldn’t catch/snag too much as a scarf. 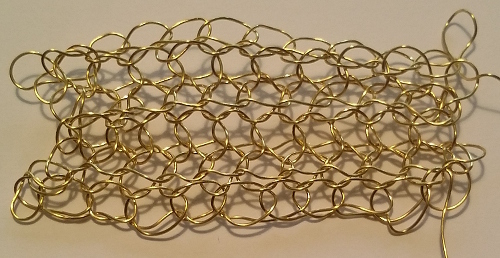 I tried some fine gold foil type thread in both warp and as a weft inlay (plain weave, no floats). It didn’t felt in at all (as I expected – too smooth, wouldn’t absorb water). The warp looks generally OK, just a few slightly loopy spots (given it didn’t shrink at all). The weft inlay has larger loops at each turnaround point – not attractive. 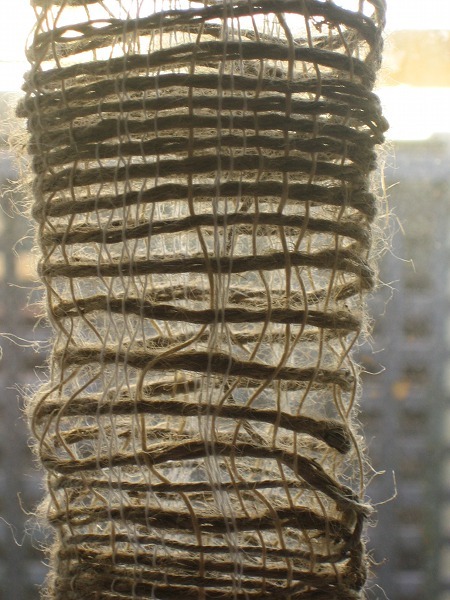 The long weft floats of the base cloth, which catch in and give wriggle room for the supplementary warps) are almost all OK in the sense of attaching in enough – just a couple of long ones in the central area aren’t great. However I do find the horizontal lines (vertical in the photo!) visually distracting. In term of the wriggly lines I was looking for it’s definitely a success. 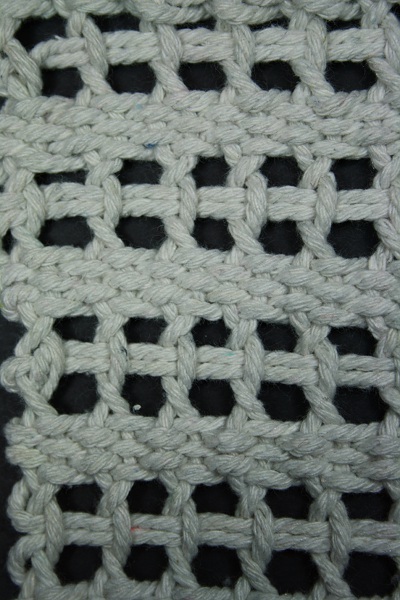 The process of weaving went quite pleasantly. (A tactful silence on selvedges!). 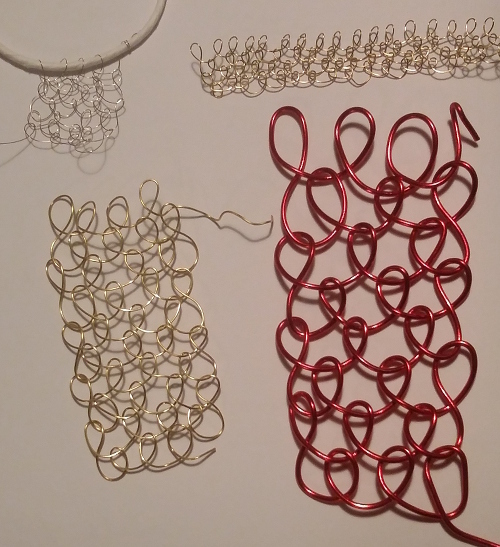 As mentioned previously my improvised threading was way off, but using pickup to create the floats gave a lot of additional flexibility, was only every 10-ish more or less picks so didn’t slow things down too much (I used the Ashford table loom) and I rather enjoyed playing with it. As for the draft, I was very interested to see Jessica-of-Sharing-the-Fiber-Fever’s cannelé post here. 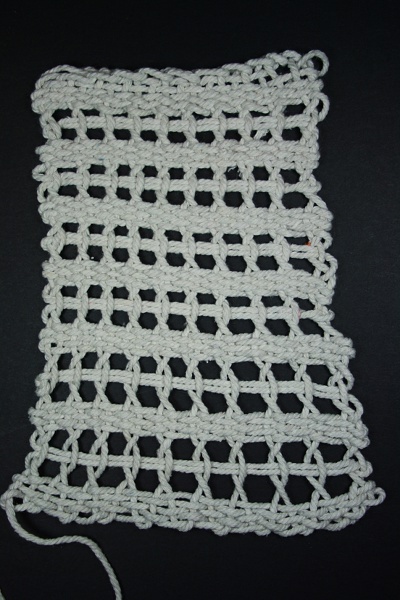 It looked very similar to the “spider weave” from Sharon Alderman’s book that I used as a starting point. (I turned her draft then hacked it badly). 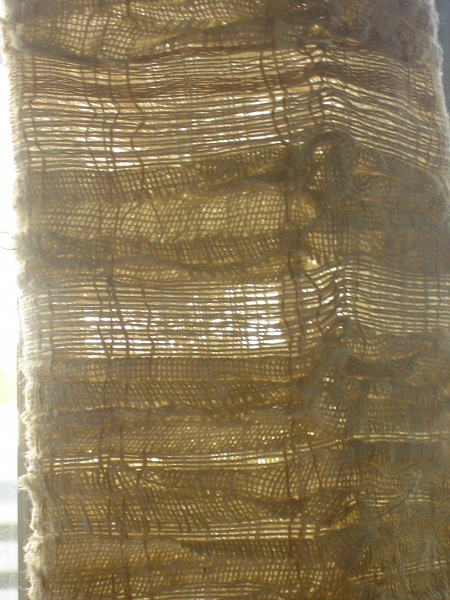 I tracked down an old article about cannelé on handweaving.net – Master Weaver No 12 1953. There are a few variations with Fig 5 looking closest to Sharon’s. 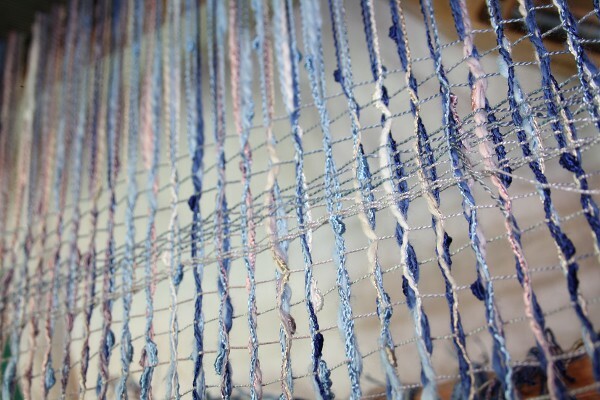 The big difference that I could see is in the warps that float over the fancy weft (remember my samples are turned). 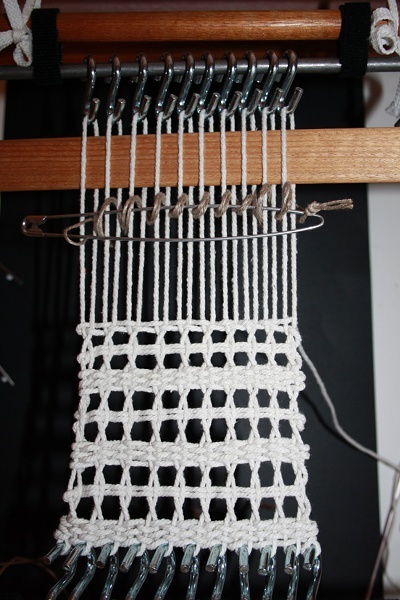 In Sharon’s draft the warps weave in with the plain weave cloth when not required for floating. The Master Weaver has them floating on the back. Yet another structure that seems similar but different is a “novelty weave” from Doramay Keasbey (draft b on page 270, discussed page 271). 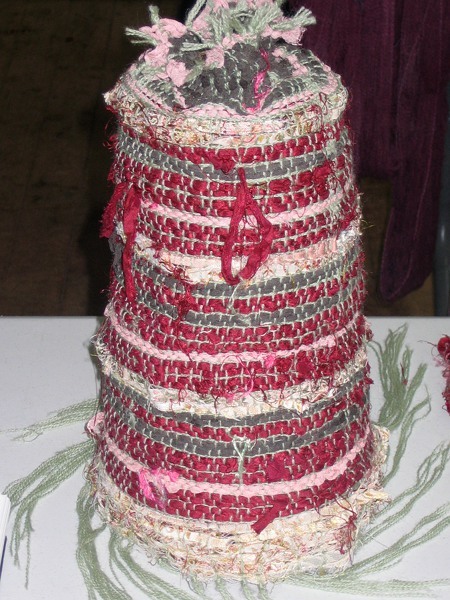 It has something slightly different in a corner of the plain weave base – just a couple of interlacements, but in weaving that could be significant. Don’t know. 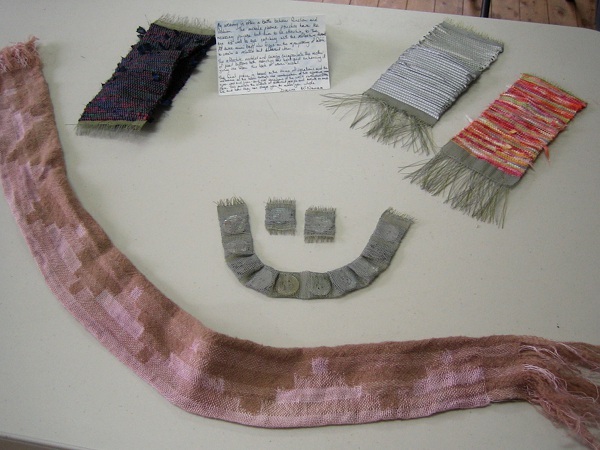 The major question for now – could one or more elements of the sample be used to make an attractive scarf? The Luce yarn is probably out (just half of one warp in the sample). Something about the chunkiness and the quick colour change makes it less graphic and interesting to me. Although it might be closer in feel to the original photo. Gold in the weft is definitely out. I think some staggering and being mindful of float length will reduce the visual distraction of the weft floats. 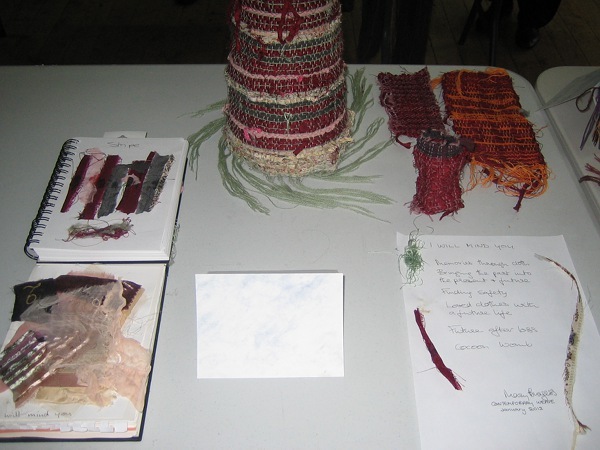 Do you know anything about the Open College of the Arts BA Textiles degree? A friend has been researching textile courses for a while and we’ve both got excited about this one. 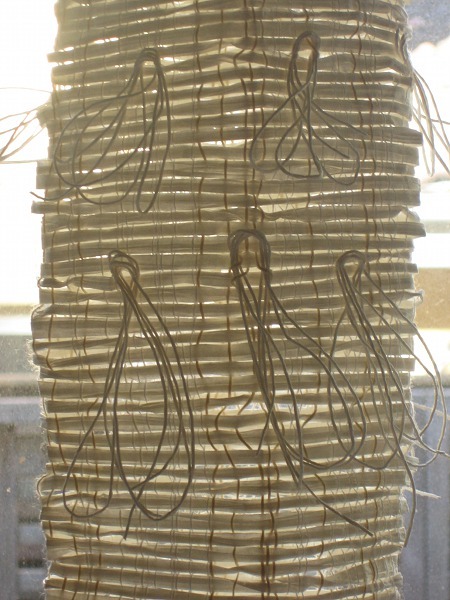 I’ve looked through OCA website, plus found quite a few “learning log” blogs of current students – http://ocacreativeartsjourney.wordpress.com/ is a good place to start since she has links to other students in addition to her own work. I’d love to learn more about the course and peoples’ experiences with OCA, so please leave a comment. 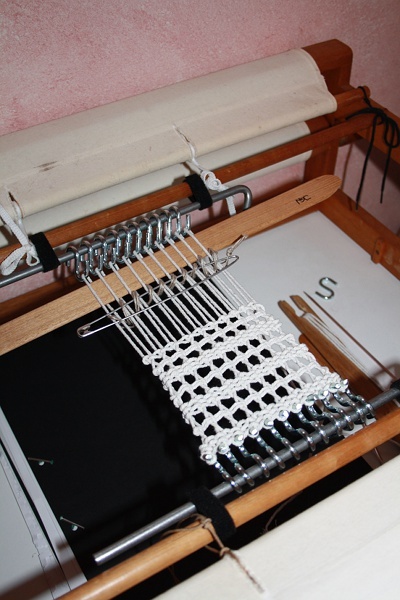 The second question was left in a comment from Isa Vogle: “Please, I am wondering if you or anyone else knows how to put short z-spun singles on a sectional loom not using a tension box. Any help would be greatly appreciated. Isa” I don’t know the background of the various constraints Isa is facing (other equipment available, width of warp etc) and have never tried anything like this, but it sounds like a potential world of pain to me. I think you’d need a nice long leader to attach to, or maybe tie onto a ghost warp? Plus there could be challenges relating to the amount of twist/energy in the singles, avoiding tangles and/or the yarn simply falling apart. Any other ideas for Isa? Finally a brief update on P2P2. I’ve started a sample using some of the ideas from here. I came up with a threading on 8 shafts which I thought would give me the plain weave background and some options in the positioning of the floats that allow movement. It was immediately obvious that I had no idea what I was doing and the threading was rubbish (well, the plain weave base worked)! Fortunately my good friend the pickup stick has helped enormously and I think I have the hang of it, with the bonus of lots of flexibility. The proof will be in the wet finishing.